I took Liz to the airport this afternoon where she met up with Judy Beckerson, another 'veteran' of many B2A trips, and Karen Orton, one of the nurses.. The others are flying out from Manchester and they will meet up, for the first time, in Dubai airport, before flying on to Dar es Salaam, which is now just the commercial capital of Tanzania, the administrative capital having moved to the new city of Dodoma back in 1996. Emirates Flight EK 004 took off from LHR at 20.31 and is due to land at Dubai at 06.48 tomorrow morning. Whilst she won't be leaving the airport, Liz is hopeful of seeing the world's tallest building, the Burj Khalifa (right), from the air. At 829.8 metres, it dwarfs The Shard in London (the tallest building in the EU) which is a mere 309.6 metres tall. After her experiences at Istanbul on the way back last year, I think she is hoping for a quick transition to the flight to Dar es Salaam. I believe the others are on Flight EK 020 which took off late from Manchester at 20.55 and is due to land at 07.51 and so they should all meet up without problems and have plenty of time as the onward flight is not until 10.30. I will be joining Liz in Tanzania at the end of her B2A work and so it was very odd, when saying goodbye at Heathrow, to think that the next time we see each other will be at Kilimanjaro Airport. Bearing in mind that dentists are now known as 'Doctor'... , and the town of Ujiji is not that far away, I have my words of greeting ready! As always, please let me have feedback (email colin.stringer@ntlworld.com) about this blog and let me know where you are reading it. The Heathrow flight landed at 06.54 and the Manchester flight landed at 07.36. I awoke this morning to find a text from Liz, saying that the flight was great and the service superb. They are now at Dubai, which she says is wonderful. Flight EK 725 to Dar is now due to depart at 11.10 (30 mins late) but they will have plenty of time at Dar before the final leg to Mwanza. The first leg was about 6 1/4 hours and the next leg is 5 hours. I also received this photo from Elaine, one of the nurses from Manchester. I am not sure who everyone is, (apart from Judy, 2nd from left). I have had feedback from a reader in Lanzarote, in the Canary Islands; always strange to know that people are taking the trouble to follow Liz's trip, wherever they happen to be. Flight EK 725 took off from Dubai a little late at 10.51 and landed in Dar at 15.11 They had a 4 ½ hour stopover in Dar before catching the FastJet flight up to Mwanza. Liz texted me from Dar airport to say that they had managed to get into the Flamingo Lounge, which was nice as it is VERY humid in Dar. On the right is a photo of them doing Pilates exercises in the lounge. I have a note to point out to Liz's Pilates instructor, Slim, that she is keeping up with the exercises ! By the time that they reach the hotel in Mwanza this evening they will have been travelling for about 26 hours. I got a text from Liz at 19.18 (22.18 in Tanzania) to say that they had just arrived at the Palace Hotel in Mwanza, where they had been met by Joyce Mpanduji, the Programmes Co-ordinator and Moses, the driver whom they had had on a previous trip. Nothing more tonight, either because of lack of signal or, more probably, because they were shattered after the 3 legs of their journey and the 'culture shock'. As I probably won't hear from Liz until this evening, I thought that I would give a bit of background to this trip and how it differs from Liz's trips in previous years. There are just three dentists and two nurses but they will still be training SIX clinical officers (COs), as in previous trips. The aim, this time, is that they will be accompanied to the clinics by FIVE District Dental Officers (DDOs), who will assist in the training of the COs. Each of the DDOs will train one of the COs, with the UK dentists providing oversight and guidance, as well as taking it in turns to train the final CO. Don't worry - I found it confusing at first but the principle is that the charity wants to try to make the Tanzanian dental community - small though it may be - able to run its own training courses for rural clinical officers so as to be able to provide basic dental care out in the remote areas. Tanzania is a vast country and B2A will still be providing direct training to COs as well as this new 'train the trainer' approach, which is known as PHASE TWO. For more details see http://www.bridge2aid.org/our-work/phase-2-training-the-trainers/ . Liz's friend Kiaran Weil, a dentist from Lancashire, went out in the Autumn to deliver the first part of the training to the DDOs and Liz and the others will be reinforcing the messages to those same people. I spoke to Liz in the evening when they had arrived in Geita, the town where they will be based for the next 8 days (see map on right). In Mwanza this morning they met Dr Joseph, the Clinical Director for B2A. Liz had first met him a couple of years ago when he had been the DDO in Musoma, a town in the North East of Tanzania. He will join them at the second of their two clinics. There was a large storm and so they had to wait 2 hours for the ferry (see map) across the inlet. Another smaller boat took several of the vehicles, including their own, but they were not allowed onboard as it was 'a bit dodgy'. They had visions of their Land Rover sinking without trace into Lake Victoria. As a result of the delays, they did not make it to Geita until 16.00. Until last week they had been due to stay at the Hotel Lenny, which is a new hotel, where Liz had stayed this time last year but, for various reasons, the arrangements were changed and they are now in the Hotel Mpiga, which is a lot more 'African'. Armed with her newly-acquired skills in Swahili (she is doing an evening course at the School of Oriental and African Studies) Liz told me that this means 'beat' but it remains to be seen whether this refers to the all-night music or whether it 'beats' the other hotels - I somehow doubt if it will be the latter ! Tomorrow they will meet the Regional Dental Officer before driving to the first clinic in Nzera (see map) which Liz visited in 2011. It will be interesting to see what, if anything, has changed. Now, what are the chances of that ? I was searching through Google, looking for an image of the village of Nzera, when I came across an aerial picture of the town. The website where this website was to be found ? The blog, on my own website, of Liz's trip in 2011 ! So here it is again to give you an idea of the sort of place they go out to. Today they went to Geita Hospital and met the Regional Dental Officer and the Regional Medical Officer. They also saw the surgery of the District Dental Officer who is based there. It has a nice chair but only the suction unit works and so, whilst he can do extractions, he cannot drill and do any fillings ! They also met the Regional Administrator and updated him on the programme. They are hopeful that he will waive the visa fee; it always seems plain daft that, even though they are going out to train local staff - FOR FREE - they have to pay for a working visa. In the evening there was a power cut and so the hotel's back-up generator was fired up (at least it has one! ), sounding like large lorry running outside the bedrooms. When I rang they were ordering a 'box' of wine and seemed to be enjoying themselves, although the lack of power had meant a delay to dinner. The hotel is better than some she has stayed in whilst out in Tanzania. Last night there was a hole in her mosquito net and she could hear one buzzing around but today there seemed to be a new net. There are only 4 DDOs as one of the districts would not let their DDO come because of budgetary constraints. Similarly, there are only 5 COs, one of whom will be bringing her baby, Daniel, with her every day. Today they saw 55 patients, which was quite good as they only arrived at 11.00. The area is a pineapple growing area (not good for teeth) and they saw one 24 year-old woman who had an abscess that was draining through her cheek to the outside, caused by three rotten teeth. Liz also had a first as the CO, who was taking the medical history in Kiswahili, told Liz that the patient was complaining of 'scrotal itching'. This was duly recorded in the notes ! A lady in the village made them lunch with bananas and papaya. Tomorrow they will be doing a full day at the clinic. It looks very much as if, due to lack of any internet connectivity, there will be no 'live' pictures coming from Geita. Elaine Gaffney is with them and she is usually very good at sending through pictures but without WIFI even she is not able to send anything through. In Geita district, north-west Tanzania, over 70 per cent of households depend on agriculture for their livelihoods. Major food and cash crops include cassava, maize, sweet potatoes, beans, cowpeas, yams, cotton and groundnuts but, most of all, this area is know for having the sweetest pineapples in Tanzania, known locally as “mananasi”. 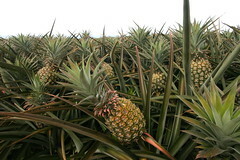 Liz reported that they were lying around in piles at the side of the road - sounds like paradise as I love pineapples ! After yesterday's incident, I looked up 'itchy scrotum' in Liz's Swahili dictionary and sent her a text just with those two words in Swahili. My ploy worked; she innocently showed my text to one of the DDOs and all of the Africans burst into laughter and she had to explain the background ! Their 'fixer', Mussa, had to buy a padlock yesterday to lock up the room that they are using at the Nzera clinic. Unfortunately he put the key on the hotel key ring and left it with reception this morning. They had to borrow a crowbar and break their way into the room before they could set open the clinic. Luckily the first patient appeared to have 'previous' of breaking and entering ! Needless to say they have not let Mussa forget this incident. On the left is a picture of the sort of murram road that they drive along for 1 ¼ each way, every day. They saw 73 people today, including one lady, a widow, who had had toothache for TEN years ! Liz and Judy spent the morning assessing the DDOs, looking at their teaching skills, etc. In the afternoon Liz took over training the 'spare' clinical officer, Enoch. The hotel, although fairly basic, has been looking after them, serving up a fish curry this evening. Liz had been wishing that Brian Westbury, one of the dentists from a previous trip, had been with them as he was a past-master at fixing toilets but the hotel had fixed hers by the time they returned from the clinic. Hopefully they will be able to email some photos at the weekend, including more impromptu Pilates classes ! They stopped to buy some pineapples at 11p each. 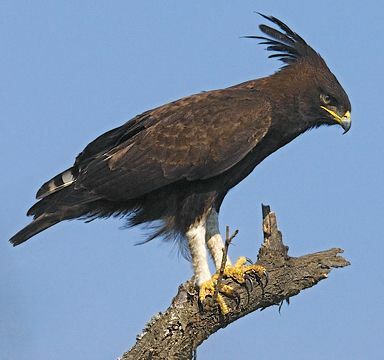 From her description, Liz, ever the bird-watcher, said that she saw a long-crested eagle (right) on a post by the side of the road. When I refer to the town of Geita, where they are staying, I don't know what image you conjure up in your mind but the picture on the left is the reality. The main road is tarmac but crumbling at the edges. The irony is that, just outside of the town is one of the largest gold mines in Tanzania, where the team was billeted back in 2011. Liz says that it is definitely NOT a place where you would go out for a stroll in the evening. It took them 1 ½ hours to get to the clinic today as it has been raining and there were lots of people cycling, trying to avoid the pot-holes. They carry huge loads of sugar cane, pineapples, cassava or wood on their bikes. They passed a large herd of Sanga cattle (the ones with the huge horns), which were being driven down the road (no, with sticks, not sitting in the passenger seat!). They saw 100 patients today, which is a lot, including two children and a woman with rickets, which Liz had never seen before. Karen and Elaine (the two nurses) have put the driver to work in the sterilisation room as they feared he may have been dozing ! He does not actually work for B2A but seemed keen to get involved. Liz treated a 6 year old girl with a very swollen face. She had gone to Geita Hospital to have a tooth extracted. The mother has 8 children and the father has disappeared off the scene. The mother could only afford the cost of the extraction but not the recommended follow-up antibiotics which cost, wait for it..... 64p. Liz's text broke on my phone whilst I was down at the gym, drinking a £2 orange juice. B2A are paying for the course of intravenous drugs. The town of Geita is, once again, without power and so Liz is pleased that the hotel has a generator, even if it is somewhat noisy ! Apparently they phoned their food order from the Land Rover, on the way back to base, but the cook had gone walk-about and they had to wait. On the positive side, the food is getting better each day. 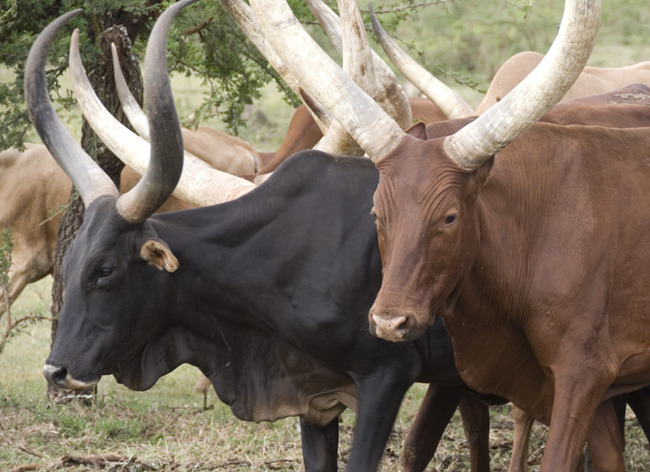 Featured right are Sanga cattle of the type that they saw yesterday. I wouldn't fancy crossing a field of those! It was a busy day today, despite the fact that it was very dark as it was raining hard. They saw 124 patients and had to set up another work station in order to treat all of the patients. Liz and Nadine have been training the sixth Clinical Officer today. As this was their last day at Nzera, they had to finish earlier in order to pack up and take all of their stuff back to Geita, ready for the second clinic on Monday. For part of the time Liz worked by herself in order to ensure that they saw all of the patients who had turned up, calling in the patients using her command of Swahili numbers; I imagine that she was very chuffed when the patients seemed to understand what she was calling. Abel translated for her and held the torch (bear in mind that there is no electricity!). She saw the auntie of one of the B2A team and was keen to make sure that she did not mess up the treatment. Emergency DIY dentistry in the area includes, apparently, stuffing a cavity with paracetamol or even applying battery acid ! Two of the DDOs, Dr Elisha and Dr Ayo, travel with the UK team to the clinic every morning and they have been chatting about the new president (see http://www.bbc.co.uk/news/world-africa-34670983 ). Apparently he cancelled the big celebrations for Independence Day as he felt that the money could be put to better use to build roads and schools. The government officials got a packet of nuts and a bottle of water instead of a champagne dinner ! The daughter of Dr Ayo, whom Liz and the team trained in Babati two years ago, is now studying dentistry in Moshe. Liz drew my attention to the fact that, somehow, some photos of the clinic have made their way onto the B2A Facebook page and so I have 'borrowed' one of these. Here you can see the patients being taught about oral hygiene and a practical example of the torch that I referred to above. Tomorrow is a day off and so they are heading off to the local market and then to lunch at the home of some friends of Ian and Jo Topley, the founders of B2A. Hopefully they will be able to get internet access and send through some of their own photos. Have just returned from church to find an incoming email from Elaine with the photos below. The birds (the avian ones!) are marabou storks. I can only assume that the one-legged activity is some sort of Pilates exercise. The first photo is of the five of them at the Victoria Palace Hotel in Mwanza and very much NOT the Mpiga Hotel in Geita. The ferry is the one across the inlet of Lake Victoria which they had to take to get to Geita from Mwanza. Just received greetings from a friend who is waiting to catch a plane at Glasgow airport (not quite as exotic as Tanzania but Swahili is probably easier to understand!). He had just been asked for his boarding pass so that one of the shops could reclaim the VAT and then sat down to read about the lady not being able to afford the antibiotics for want of 64p - what a contrast ! This morning they went to a local market and, quelle surprise, ended up at a shop that sells material. The only real surprise is that Liz did not buy anything ! Karen and Elaine, however, ordered some scrubs in bold African colours; Liz already has some with animals on. After that they went to the home of 2 American expats, Aaron and Marissa, who provided a welcome BBQ. They live near Geita with their four children. Unfortunately, on the way home, the driver, Mussa, took the corner out of their drive too sharply and they ended up in a ditch with one of the front wheel 2 feet in the air. They had to clamber out on the offside and wait whilst the vehicle was hauled out. Despite the need to express thanks, Liz turned down Abel's invitation to the 2 ½ hour evening service at Geita Cathedral ! Back to work today, but this time at a new clinic. 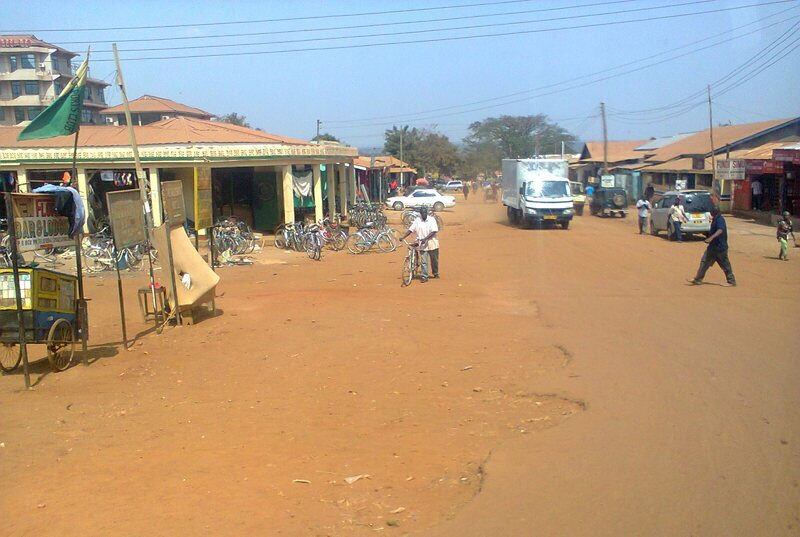 This week they are in Katoro, which is quite a large town, about 40 mins further down the road away from Mwanza. It has some 50,000 inhabitants, although that may include those living in outlying villages. At least their daily journey will only be about 40 minutes along a tarmac road. Liz reports that the Katoro clinic is unchanged from her last visit there in 2011. They are, once again, working outside on a verandah but at least, this time, they have some hospital screens to provide a bit of privacy but these haven't stopped three dogs, which they have to keep shooing away. On the way home, Liz saw a donkey standing in the waiting area of one of the other clinics - put her in mind of Dr Doolittle ! Of course, this sort of thing would never happen at the Lister Hospital in Stevenage ! READ ALL ABOUT IT ! The ceiling fan and the strip light are actually working in the sterilisation room; I imagine that is very welcome as it must get very humid. They saw 80 patients today and had the mother and baby clinic next door to them; as a result, they have treated quite a few mums. There is actually a dental therapist working at the clinic who trained for 3 years and has been working there since May. They saw his room which has an old dental chair. The only problem is that he does not have any dental instruments ! They treated a very old and frail man who has had a dislocated jaw for THREE months. The DDO is arranging for him to have a general anaesthetic at Geita Hospital to correct the problem as he cannot bite together properly. On the left you can see a photo of the team enjoying a lunch of beans and rice. Liz's batik scrubs are from a previous trip. As you can see, the clinic is well-built and clean but just lacks the required services. 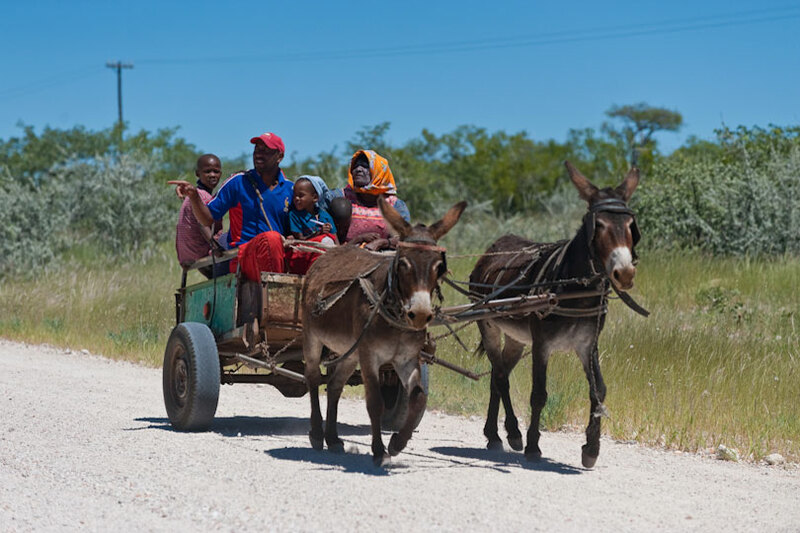 Liz reported last night that there are loads of donkey-drawn vehicles along the main road, hence today's photo. It would seem that the cockroaches that have plagued Nadine's room in the hotel are now on the move as one arrived in Judy's room overnight! They saw 102 patients today and Dr Joseph from B2A joined them at the clinic; he had got up at 05.00 to travel from Mwanza. He was very pleased with the way that the programme has gone. Today the Clinical Officers sat their theory examination after lunch. Whilst they were away the UK team carried on seeing patients with the DDOs and Liz was amazed at just how quickly they work. The therapist (see yesterday's entry) was also around and so Liz teamed up with him for a while. Judy, who heads up the UK team, is investigating why he has no equipment as this seems ridiculous. Late last night I received greetings from a friend who was reading this blog in Luxembourg; interesting to know that we've gone international ! This is their last full day at the Katoro clinic and, readers, this will be the last entry in this year's blog. I set off for Heathrow at 15.30 as, for the first time, I will be joining Liz out in Tanzania for a holiday. We are visiting Lake Manyara and the Ngorongoro Crater on safari (Swahili for a 'journey') and then flying to Zanzibar for four nights on the beach (well, in a hotel on the beach, as I imagine you guessed!) emulating our son, Luke, who went there on his honeymoon in October. Liz will, hopefully, text me an update at the end of today's clinic, which I will publish, before I leave. 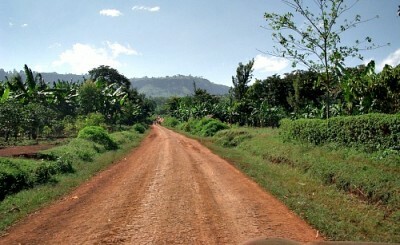 On Thursday, they will work until about 14.00 and then pack up to drive back to Mwanza. Liz sent a text through just before they had lunch. Judy and Dr Joseph were just doing the assessment of the District Dental Officers (i.e. are they ready to start running their own training courses?). They still have about 90 patients to be seen (that would be the equivalent of queuing down Knebworth High Street) and so Liz is working by herself with Mussa translating. The good news is that they have arranged for the therapist to have the set of instruments that they took out for the sixth Clinical Officer who could not attend the week's training. He has spent the morning with Karen and Elaine (the two nurses) going over sterilisation procedures. It turns out that Dr Joseph is an excellent dancer and has been performing the Macarena with the two nurses in front of some VERY mystified patients! There are lots of babies and pregnant women - apparently the average is 5.5 patients per family ! 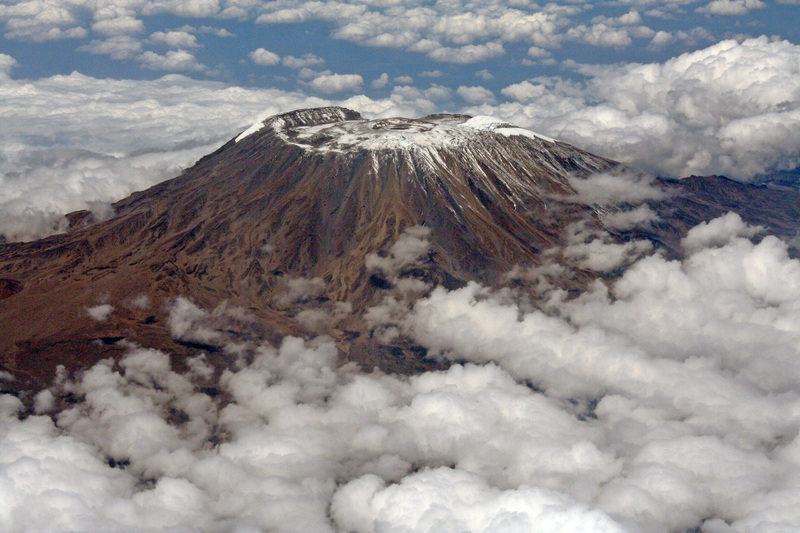 If all goes well, Liz and I will meet at Kilimanjaro airport on Friday afternoon and so I thought it would be appropriate to include a photo that Liz took from the plane on a previous trip. And, no, we will NOT be climbing the mountain !